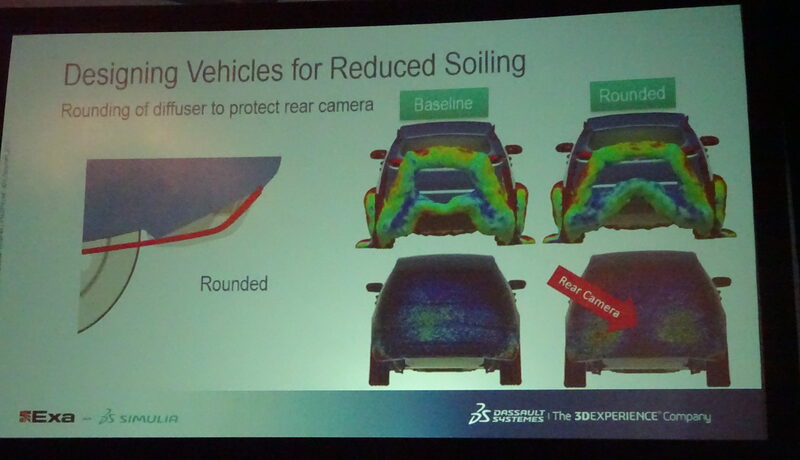 A representative of automotive design simulation company Exa earlier this year discussed how minute changes in vehicle design can make the difference between a driver, camera or sensor’s view being constantly fouled by water or dirt and a clear line of sight. The company can use software to model complex conditions such as how wind, water, heat and sound behave in relation to a vehicle. 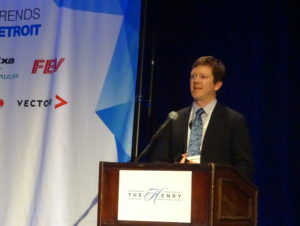 Exa director of soiling and water management Jonathan Jilesen told Automotive World’s Megatrends Detroit this can examine more mundane concerns like whether the driver’s hand gets dirty opening the door handle or if the license plate will be spattered with mud. However, it can also mean predicting whether the driver can see out the rear or front windscreens, if the water flowing onto the side glass blocks the view of the side mirrors, and how dirty the backup cameras now standard in all new vehicles will get. With the rise of advanced driver assistance systems and ultimately autonomous vehicles, OEMs need to make sure the computer can “see” as well, and Jilesen suggested his company could help here too. According to Jilesen, a change of just millimeters in a surface can have an impact on how water hits it. Asked about how large a change would throw off performance, He said, “What we’re looking at is — I think it’s about 5 mm,” he said. Anything more than that would have a “big impact,” he said. However, “it depends where it is,” Jilesen said. If a cut line isn’t present, “even if it’s 2 mm, it’ll make a difference in how that water flows on the surface,” he said. “You have to have high fidelity,” he also said. Jilesen also told the audience about experimentation by a client which found that a bus following another bus in wet conditions would receive an unwelcome burst of mirror-obscuring dirty water upon slowing down. Exa was consulted, and with a single simulation examining how water moved around the A-pillar and fell on the side glass, the company uncovered the problem. “With the second (simulation) run, we were able to solve the problem,” Jilesen said. Extending the bus’ drip rail about 1.5 inches and changing the angle of the gutter in the bus’ front removed the issue, he said. Jilesen in March described simulations of other automotive environmental interactions which seemed as though they could be affected by sloppy auto body repair. One involved a diffuser design which caused air (and the water it carried) to fall in the center of the rear of the vehicle. “Unfortunately, that was exactly where our camera was,” Jilesen said. Exa tested a change in diffuser shape that led to slightly more uplift and water traveling out to the side instead of onto the backup camera, he said. “By changing the shape of the diffuser, we changed the shape of the rear vortex,” Jilesen said. Electrification can prompt OEMs to lower the ride height and reduce drag to save battery life, Jilesen said. Unfortunately, Exa found that a 50 mm ride height (about 1.97 inches) change can lead to significantly more soiling of the rear of the vehicle. A spraying system might be unavoidable, he said. This discussion of small changes having a performance impact atop an aesthetic one is interesting in light of the 2010 Nissan Maxima we covered Tuesday morning. A Lange Technical Services post-repair inspection of the vehicle in 2014 found panel gaps at least 5 mm out of tolerance. Gaps in the rear of the vehicle were also incorrect, likely because of the collision, the Lange Technical Services report stated.